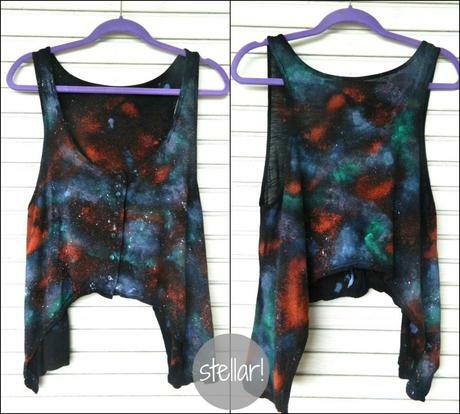 DIY ✂ Galaxy Print Tank- OBSESSED! Step 1: Get ready by laying out a towel & gathering your supplies. All you need is a spray bottle filled with a bit of bleach, some fabric pants (I used a dark blue, light blue, kelly green, red, and white), a sponge, and a toothbrush. 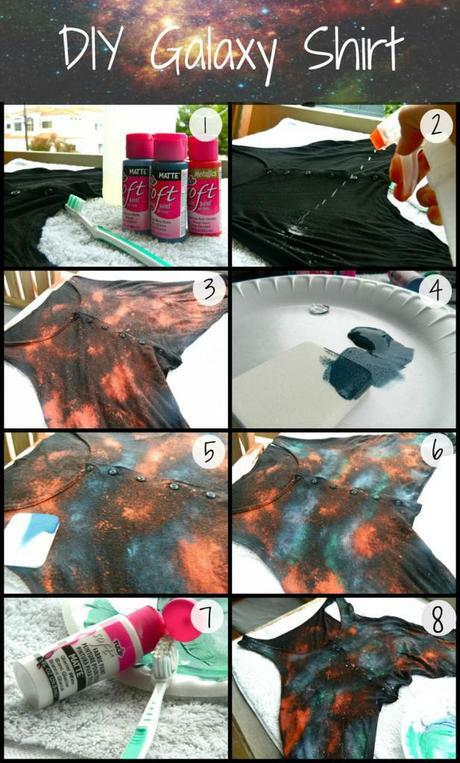 Step 2: Start off my spraying various parts of your t-shirt with the bleach. Step 3: Wait a minute or so and you will start to see the base of your galaxy form as the dye begins to bleach out the fabric. Step 4: Now for the fun part! Prep your paints and get ready to sponge. All you need is a quarter size drop of each color, a little bit goes a long way. Step 5: When sponge painting your shirt you really can’t do wrong. My general technique is to start with the dark blue and sponge around the bleached spots, next I use the light blue and create a milky way type galaxy in a few places. Once you get here, you will really start to see it look a lot like galaxy. Step 6: Throw in some green in various spots as well as a bit of red, or you can mix blue and red and use purple! Have fun with it and get creative! Step 7: Now time for your stars. Using the white fabric paint, apply it to your toothbrush as you would toothpaste. Step 8: Using your fingers (this will get messy) flick your toothbrush over your shirt to create the perfect amount of stars!